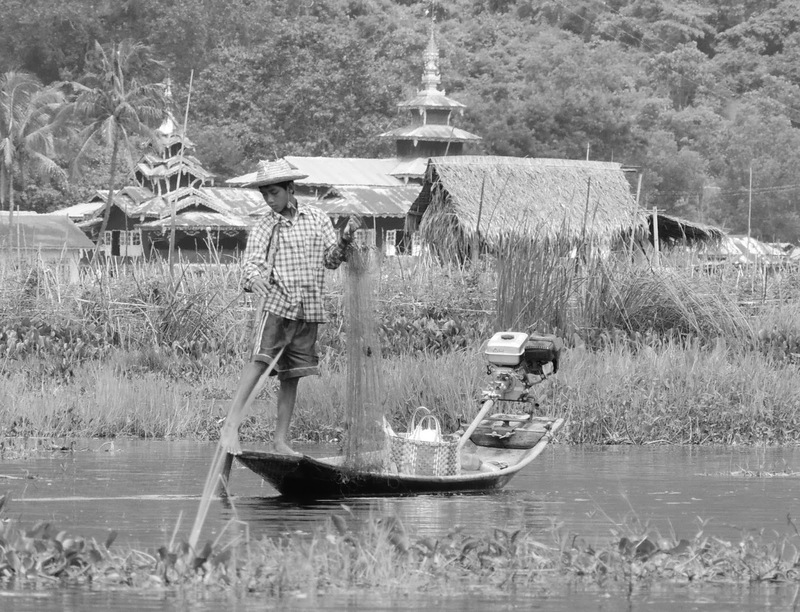 The journey to Inle Lake was fairly monumental leaving Hpa An at 9.30am and eventually arriving with a 2 hours break in the middle at 7.00am the next day. The journey made even longer by the fact that the driver played Karaoke music (literally recordings of people singing Karaoke, possibly him, which he also sang along to all night!!! I did complain but with little effect. We are staying in Nyaungshwe at Inle Lake in an unremarkable hotel in the small town centre. We went for a wander yesterday and, as is our want, turned off the road to follow a dirt track through the paddy fields towards an old looking monastery. Where, as usually happens to us, we found a friendly monk who beckoned us in for a chat. This 74 year old chap lived alone in this huge old timber building and had done so for 34 years with occasional company from another aged monk and a one week teaching stint every year. He lived a simple life of prayer and meditation. He was lovely and shared a few over ripe bananas with us whilst talking about a load of old rubbish. ﻿﻿﻿﻿﻿﻿Early to bed because we had barely slept the previous night we woke to a pleasant day with NO RAIN! After breakfast we went down to the jetty and haggled the price of a longboat for the day. We eventually agreed one price but after going to the toilet were told it would suddenly be cheaper because there was another passenger. Great! The boat is a 24 foot long boat in which we all sit in a line. The sides are steep and the engine big with long prop shaft extending out the back and it whizzes through the water at a joyous speed. Our $10 bought us use of this and a driver for 7 hours during which time we travelled all over the lake and through the extensive marshes covering somewhere about 30 miles during the day. Our travels took us through lots of floating hyacinths and reeds to a market on the lake side. "Just looking Sir, Madam, please".. Next we go to the far end of the lake past mile after mile of floating gardens. peopled by long boats and flat bed craft and reached by walking down rickety stairs to lake level. The buildings range in size from small shacks to quite large businesses all joined with power lines and telephone lines that dangle between them like rampant vines. We stop in a lotus flower weaving factory for the tour and obligatory hard sell then have lunch. All the time our fellow passenger has been featuring larger in our day but will come to that shortly. Although it is at this point, over lunch, that we notice an important detail - Many of the boats have a driver, the tourists and, always sitting in the same seat, a suspicious local person....Urrmmm! After lunch we go to another craft factory ran by the long neck people. Those who wear brass rings around their necks and legs. Apparently this process starts at the age of 9 with 14 rings around the neck and continues up to 25 rings although one particular giraffey looking woman seemed to have more supporting her inordinately long neck. We are also told that the complete set weighs 8 kilos!!! Final visit is to the cat monastery where the monks once taught cats to jump through hoops (bugger all else to do - obviously) but now just have a few cats wandering around to please the tourists. That said this very old, worn out and delightful place was wonderful with ancient looking shirnes and Buddhas all housed in a huge space supported by fading gold and red pillars. One last thing before we get to our boat guest,, The Inle Lake fishermen have an extraordinary way of plying their trade. They do so by paddling the boat by using the oar and one leg. This then leaves the hands both free to feed and gather the nets. So. . The other passenger. As stated. He suddenly appears on our boat on the quay. Burmese, 47, bad stutter, simply dressed, no camera, no bag, none of the trappings of a sightseer. He has a nice open face, speaks not bad English although stutters badly. He claimed to work for a missionary school in Mae Sot in Thailand and was here for a working holiday for a few weeks and didn't have much money. He claimed that he was a manual worker although his English, partial French, knowledge and general demeanour would suggest otherwise. To begin with he didn't speak and was just walking near us, gradually his interaction with us grew more and more...The questions come thick and fast- nothing too probing but asked purposefully with the odd one thrown in ... "What is your middle name and second name", What year were you born". He also made open accusations against the Burmese and several references to the government in a fashion which would prompt collusion if I had firm views. Anyway things went on with him being constantly at our elbow but taking no interest in the places we were visiting. For a lowly manual worker who had not been there before he was very intuitive because he also seemed to know his way around, spoke fluent Burmese, dressed in the local fashion and was not treated as a guest by those around him. Add to this that he took no lead in decisions about where or how long our boat would be anywhere and alarm bells started ringing. Eventually I could not bear it any more so flatly asked him what was he doing on our boat, was he paid to key an eye on us and gather information. We thought he was not telling us the truth because of the way he was acting. That flustered him! He denied all but he was obviously uncomfortable and started acting anxious by constantly talking about things we were seeing ... "that's a horse, it is red, this is the alter, the Buddhists believe in blah blah, that's a coconut" etc. He became cloying and I had to tell him eventually that I didn't believe him, that we didn't want him in our face, to keep talking to us and to back off and do his job somewhere else. Which he then did at about 20 metres away. Really funny because he kept the pretence of not being with us but never took his eyes off us and if he was to lose us momentarily would panic and be seen frantically looking where we were then act all casual when we saw him. All very amusing and slightly disconcerting as why the government (I am sure he was a some sort of tourist spy) would feel the need to track us here??? Answers in a box please. Oh one final thing. We finally shook him off after the boat trip by asking what he was doing now. He said he was going to get the bus. We walked up the street and said goodbye and sat down in a café for a tea. He walked off. We drank our tea then headed back to our hotel only to find Peter (the spy) walking back down the street towards us. The look of surprise was on his face was a picture as he quickly scurried away. the confined spaces and vibrant colours all scream for the eyes attention. Their is jostling, shouting, hawking, chatting and laughter all around. A great place to shop and far removed from the sanitised experience of Tescos. Out of the town and on either side of the road paddy fields stretch to the far away hills. Groups of farmer workers using threshing machines are found every kilometre or so besides heaps of dried rice stalks. There are vast fluffy clouds rising into the blue sky with the ever present thunder clouds lurking upon the hill ridges. Along one stretch of road the houses are fronted by a slow flowing brown canal in which the locals are either washing themselves, their clothes or their children. It seems we are a curiosity because we are riding outside of the town and consequently the locals are once again friendly and smiling. We drop into an old monastery - we love 'em - and enjoy the cool darkness inside whilst looking at the dilapidated woodwork, peeling paint and plaster and walking on the cool wooden floors bare footed. Groups of young monks are walking about and their voices can be heard outside of the shadowy halls whilst a flash of maroon can be seen through the large circular windows as they walk by outside. We also find a small mausoleum with small Buddhas in hundreds of Alcoves. Again the order of the day is decay - but done in a truly beautiful way with the fading reds, golds and browns of the tiles. A few more kilometres down the road we stop by a road side tea shop and get talking (well vaguely communicating) with a group of 7 guys and have a few laughs at one another's pronunciation, learn a few words in each others language and leave feeling all warm and fuzzy. The trip was to get to a railway station to buy a ticket for a narrow gauge train that runs to the town of Thazi which is in the foothills and meant to be a fabulous journey en route to Mandalay. The little town is dirty and dusty and perfect. We have lunch in a café and get served hot milk, samosas, milk curd with sugar, chipati and chickpeas. Bit weird but tasty as.